I love candles and I light a lot of them. I love the diaphanous, unpredictable movement of the flame in even an imperceptible breeze. I love the Joseph Beuys-like materiality of wax. Of the small warmth coming off the candle indoors in the winter, or out on the veranda in the summer. I had dinner at my cousin’s house tonight. They have lots of “fake” candles. They have a bit of ambiance, but they’re pretty far from “real” candles and the difference is notable. But technology tends to improve. What would the experience of a virtual candle that was closer to an organic candle be like? The uncanny valley is a hypothesis in the field of aesthetics which holds that when features look and move almost, but not exactly, like natural beings, it causes a response of revulsion among some observers. The “valley” refers to the dip in a graph of the comfort level of beings as subjects move toward a healthy, natural likeness described in a function of a subject’s aesthetic acceptability. Examples can be found in the fields of robotics and 3D computer animation, among others. Some time ago I read a great article about plastics. The author argued that plastics are at their worst when they try to deny what they are, and at their best when they celebrate what they are. In the case of fashion, plastics are at their worst in the old polyester leisure suit that does a terrible job of denying it’s plasticness. And at their best in a vinyl miniskirt & go-go boots, where plastic boldly celebrates its identity. What’s with vegetarians who eat tofu bacon or veggie burgers? Why don’t they just eat meat? Or don’t? But why dance on the edge with fake meat? Aren’t you not eating meat and reinforcing its desirability all at the same time? One day electronic candles will cross the uncanny valley. IDK what that will mean. Maybe fire will be too archaic on that day. But for today, why should electronics try to pretend to be wax candles, when they could celebrate their uniqueness in extraordinary ways. 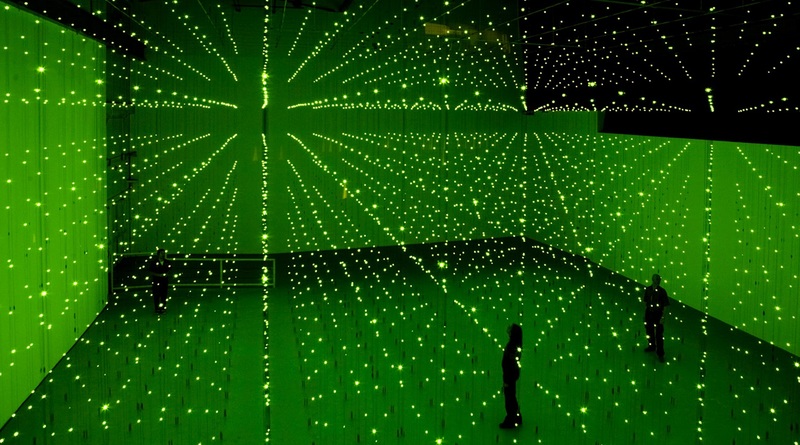 The zillion LEDs in an installation by an artist like Erwin Redl don’t pretend to be candles. Don’t try to do what candles might do. Instead they celebrate their LEDfulness, their syntheticness, in intense, otherworldly, powerfully visceral experiences. Or much more modestly my LED USB cables to charge Android & iOS devices aren’t anything like candles. Yet they are an amazing presence in my home. Goodbye polyester leisure suits and fake candles. Hello vinyl miniskirts & LED USB cables. You show me experiences that never were. Artist & Arts Educator based in Los Angeles.